BLE means that your device, phone, computer, tablet, will save energy: a connection can be established in just 3ms (vs. 100ms for Classic Bluetooth), peak energy consumption is less than 20mA while communicating in this mode, data is transferred quickly and then the connection goes down again. This is why it opens the doors to a host of new ultra-low power Bluetooth accessories, which can be powered for over a year with just a coin cell battery. These could include a pedometer in your shoes sending continuous information to your phone, various health monitors (heart rate, glucose and blood pressure monitors) sharing information not just to a specific receiver but to any Bluetooth 4.0 device and smart watches that can pair with your phone or computer to exchange and display useful information. Bluetooth 4.0 also has the ability to perform NFC type activities, pairing without a code, so you could possibly perform payments or share information with another device but over a longer distance than NFC — NFC has a range of around 0.2m whereas Bluetooth’s range is tens of meters, depending on the application. It could allow devices to perform smart tasks, such as sharing of data between two smartphones when you ‘bump’ them together or use your smartphone to unlock your personal computer just by placing the phone next to it. This makes us think that Apple might have intentionally omitted the inclusion of nascent NFC in the latest iPhone 4S and instead could be betting on Bluetooth 4.0 as a more general and more useful specification. The new standard however is still taking its first steps, version 4 was announced last December, and as we’ve mentioned the iPhone 4S is the first and currently the only phone to support the specification and very few accessories can take advantage of its new features. 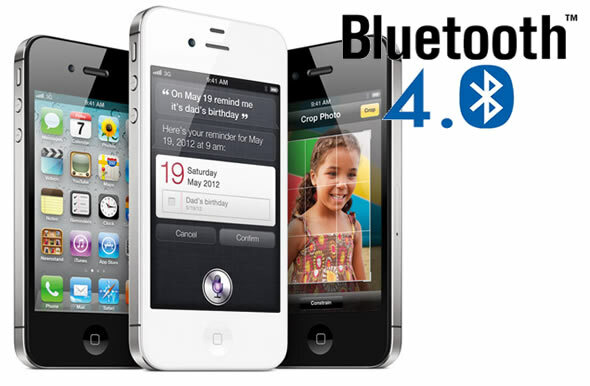 However the Bluetooth SIG (Special Interest Group) has stated that by the end of 2012, 100% of smartphones will feature version 4.0, as Bluetooth 4.0 radios are cheaper and smaller than their 3.0 predecessors. Data Transfers – Bluetooth low energy technology supports very short data packets (8 octet minimum up to 27 octets maximum) that are transferred at 1 Mbps. All connections use advanced sniff-sub rating to achieve ultra low duty cycles. Frequency Hopping – Bluetooth low energy technology uses the adaptive frequency hopping common to all versions of Bluetooth technology to minimize interference from other technologies in the 2.4 GHz ISM Band. Efficient multi-path benefits increase the link budgets and range. Host Control – Bluetooth low energy technology places a significant amount of intelligence in the controller, which allows the host to sleep for longer periods of time and be woken up by the controller only when the host needs to perform some action. This allows for the greatest current savings since the host is assumed to consume more power than the controller. Latency – Bluetooth low energy technology can support connection setup and data transfer as low as 3ms, allowing an application to form a connection and then transfer authenticated data in few milliseconds for a short communication burst before quickly tearing down the connection. Range – Increased modulation index provides a possible range for Bluetooth low energy technology of over 100 meters. Robustness – Bluetooth low energy technology uses a strong 24 bit CRC on all packets ensuring the maximum robustness against interference. Topology – Bluetooth low energy technology uses a 32 bit access address on every packet for each slave, allowing billions of devices to be connected. The technology is optimized for one-to-one connections while allowing one-to-many connections using a star topology. With the use of quick connections and disconnections, data can move in a mesh-like topology without the complexities of maintaining a mesh network.